Experience the revolutionary contact lens therapy that gently reshapes the front surface of your eye while you sleep. Wake up and enjoy clear vision throughout the day. Orthokeratology is a gentle, safe, and reversible procedure that was approved by the FDA in 2002. 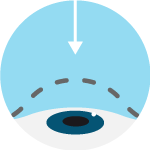 It utilizes a specialty contact lens designed to gently mould the cornea (or front surface of the eye). It is designed to be worn only while you sleep and when removed in the morning, allow you to see clearly and naturally without any eyeglasses or daytime contact lenses. Ortho-K is a great option to being glasses-free without having to do surgery. Myopia, often referred to as short-sightedness or near-sightedness, is when a person’s long distance vision is blurry. A person who is myopic can see things clearly up close, but objects far away are blurry. Learn more about myopia and why leading researchers around the world are warning of a global myopic epidemic. There has been more and more research demonstrating that Ortho-K lens wear is one of the leading methods in slowing down a child's nearsightedness. At our Myopia Control Center, we utilize the latest technology and research to offer the best management option for each patient and child. Visit us at our newest location!